7.75 points at 16 votes (rank 139). 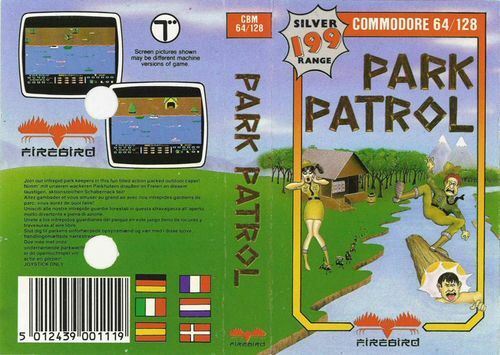 Park Patrol is a collecting game by Activision, which was first released only on the American market in 1984 and only in 1987 published in Europe under the budget label "Silverbird" of the software house Firebird. In the Poconose National Park all hell is loose: Careless tourists have litttered the whole area with cans, bottles and gummi balls and they also bathe of all things in the only reserve of the white dotted blue striped pink swamp snake that is left. If something goes wrong there, there will be lots of trouble with the tourist association...or Greenpeace, depending! Therefore they are looking for competent boys and girls who want to fill in the sacrificially honorary post of park guard in their holidays. A motor rubber boat, snake defence spray and supply are provided, you get for free lots of exercise and fresh air. Also, the animals are totally grateful that somebody helps them! As highly motivated park guard collect all twelve carelessly thrown away bottles, cans etc. in every section on water and land and jump in to help if one of the bathers is threatening to drown. But also take care that you do not get too close to the local fauna, the turtles and snakes are only curious, but you never know! For you not to keel over, you need to eat enough, because if your calories go to zero, you lose one of your four screen lives. Unfortunately, also hungry army ants have zeroed in on your supply, so keep your eyes and ears open so that they do not steal your meals. When all trash in a section has been collected, the calories left are added as bonus points. There is an extra life every 20.000 points. If the supply in the storage is empty, the game ends independent of the screen lives left when the current character has an accident or the energy is empty. A long sight duel precedes the hard fight about the can deposit, before the match ends in a draw. The sprites in the game are fuzzily defined, seem slightly bold and somehow strechted in width. They are also only animated with few movement phases. The choice of colour for the logs (pink) seems strange, but it was probably chosen with the thought that they will be harder to distinguish from the snakes. Together with the also pink items that you should collect is the total share of pink in the game - in contrast to e.g. green - rather high. 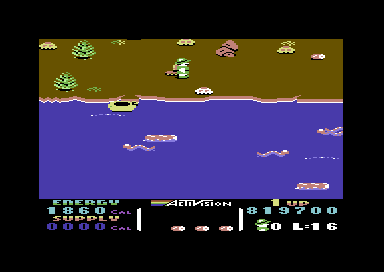 As a substitute for green was more brown used, therefore the impression of a scarce landscape prevails, but is still nicer to look at than other resorts on the C64, as e.g. Crystal Lake from Friday the 13th, which was obviously built on bare concrete. The park guards on the other hands seem to be albinos. The scrolling is done smoothly and enriched by a parallax shift, as also known from Forbidden Forest. Reflections of light an turbulences in the water are nice to look at and give the otherwise rather simple but for 1984 definitely successful graphics an additional twist. 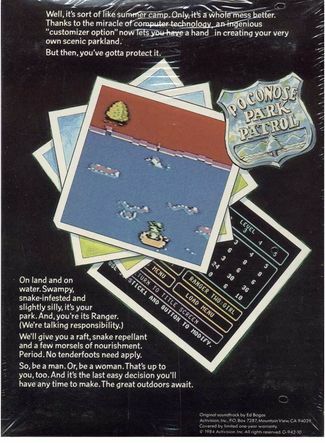 Park Patrol's graphics still radiates recognizably the charming greenness of the "Golden Age of Videogaming" and reminds of earlier Activision games for the Atari VCS. Unfortunately, the typical "Activision sunset" from VCS titles as Frostbite, Barnstorming or Keystone Kapers was not used here, it probably would have fitted very well. Next to the as crazy as short title tune, the game has five starting tunes at the beginning of a new level, which start in three voices to be reduced to one voice after about 15 seconds and tootling around as unobtrusive background music. The eighteen sound effects and jingles for events in the game sound creative and "arcade-like", amongst them a wailing sound for drowning swimmers and the snickering of the ants when they steal food. The responsible for the section sound, Russel Lieblich did not anticipate later great people as Rob Hubbard or Martin Galway but has nevertheless competently equipped the game acoustically. Why does the use of the snake defence spray cost 200 calories? Is the can that heavy or do they need to...eh...prepare the stuff first? You start the game with 1000 calories of energy (display "Energy") and 8000 calories in the storage ("Supply"). Each half second you lose ten calories of "Energy", if your energy drops to 0, you lose a screen life and 1000 calories are subtracted from your storage for the next life. If you still have lives left but no more energy, the game ends! If you have less than 1000 calories of "Energy", you can enter the storage to book 1000 calories from the "Supply". You can have a maximum of 1990 units of energy. At the beginning of each level, the storage is filled up to 9000 units of "Supply". At the end of each level the unused calories from "Energy" and "Supply" are converted to bonus points. Unusually fast turtles hang around on land and attack every park guard that comes half near. In their eagerness or out of pure dumbness, they often overshoot and fall into the river. Show a heart of gold and rescue the pour animals for 200 bonus points. If you do not do it, the turtle gets angry, changes its colour and drag itseld onto the land with its own strength. Now it is even more aggressive and cannot drop into the water in this state or get lured in. After a while it flashes and gets yellow again. Touching a turtle costs a life. From level two onwards water snakes join in, which mainly feed from rubber boats. You can use your patented snake defences spray (TM) against these animals, by pressing the fire button when you are not directly at the bank. Then all snakes that are currently on the screen dive down. However, this action costs 200 points of "Energy". It does not work, if you are at the bank wit the boat. In the fourth level the hungry army ants join, which have zeroed in on your supplies in the storage. Each ant tries to carry away 1000 points "Supply", if you do not stop them in time. This is done by jostling the insect either from behind or the side, not from the front! Then, the ant drops the supply and either falls into the river or marches back to the storage, depending on the side from which you shoved it. If you have less than 1000 points of "Energy", you can instantly pick up the meal that lies around, otherwise it stays there and can be pickup again by another ant. The food is only then completely lost, if an ant makes it to drag the food several screens to the right and leave the game area. A high "snickering" tells you when an ant has picked up supply. Most of the time these mates are occupied with doing the crawl somewhere near the storage hut and pulling the peg from your boat when you touch them. However, often one or more of them at the same time get into trouble : a cry for help sounds and the message is shown at the lower right of the screen. If you make it in time to collect the swimmer, you get 5000 bonus points and 1000 calories to the storage for this heroic act. If the swimmer drowns you lose a life due to failure to render assistance as a punishment. The snakes cannot harm the swimmers. At the beginning of the game this strange plant is not more than an inconspicious bush some screens further to the left of the storage hut. But you can water it by touching it (then a "bing" sounds). 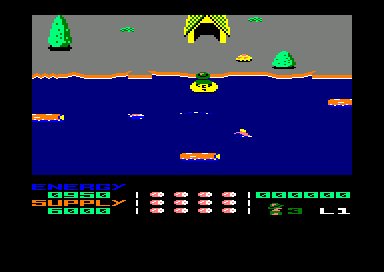 Each time you have rescued a swimmer or a turtle, you can repeat this until a purple fruit has grown that can be collected by pressing the fire button.This does not get you any points but the character has the double speed for moving on land for a limited amount of time - a bar on the left side of the screen shows the time left. Against the usual opinion that magical plants also give invulnerability, this is only limited to the speed bonus. After all we are not in Super Mario Land here, this is a decent game! The tree log manouevre: If you can make it to land on a log by crashing into it with the boat and balance on it with the help of and jumps until the time at the right has run out, you get 5000 bonus points for extreme showing a pose. The author of this article needed approx. 50 tries until this gif animation was finally "in the can". Only recommendable for real go-getters. press fire in the boat and not at the bank, to chase away the water snakes. Costs 200 calories. The parameter menu. Here would have been the ideal place to load and save a highscore. Unfortunately, this function was not implemented. By pressing the key F5 you can get from the title screen into this menu, in which you can change the number of enemies and save/load and primarily change if you want to play a male or a female park guard. A nice detail that was already built into Last Gladiator and later amongst others into Barbarian II - The Dungeon of Drax, where you also play park guards in rubber boats, that... well, or something similar. The turtles can be lured into the water by staying on the land near the bank and jumping back into the boat at the last moment. If you then collect them, they stay out of the game until the end of the level. Do not hesitate to use the snake defence spray, especially if several snakes are on the screen. By the inertness of the rubber boat it is sometimes very difficult to manoeuvre around them. Always kick the ants from the top downwards: the ants roll into the water and you have the peace: if you kick it from below the ant will instantly continue on its way. If a can/bottle/ball is proteced by many turtles, then collect this item last: The level will then instantly end and you do not have to try to escape from being surrounded. Always keep an eye on the calories (not the ones in the fridge, the ones on the screen you glutton! ), so that the energy is not empty in the middle of the game. When only 400 calories are left (20 seconds of game time) it is definitely time for a lunch break. In the higher levels you should first use the supply that has been carried away by the ants. At the uppermost border of the river you are mainly safe from the snakes, but not from the swimmers. To care for the plant is forlorn hope as soon as all the trash on land has been collected. The ranger is not only very agile at water and land, but also in the air; you can also navigate in the air during a jump, which can be a lifesaver after the take-off e.g. in case of obstacles or enemies, but also with failed jumps as a last means of correction. The version by Remember has trainer options for unlimited number of lives, energy, a level skip and the loading screen of the cassette re-release, made by Paul Docherty. Robotron2084: "A really hearty and uncomplicated arcade action highlight with nice details, happy tunes and even an environmentally conscious message. 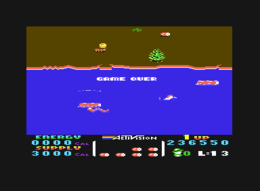 Plays tiptop and is in my opinion the grand finale of Activision's "early" phase on the C64. However, I would have been happy about a saveable highscore and the sunset mentioned in section "graphics". But as it is, it is also very recommendable and therefore I give some fat 8 out of 10 points." Flodder: "A nicely made, endearing little game in usual Activision qualitiy. I admit that I aleady had a copy in 1985 as a European (what a criminal I am) and played it with much fun. The game idea stands out pleasantly from the usual shoot-em-all or jump-from-platform-to-platfom of the most games in this era. So it is sitll today worth to risk a game or two every now and then. 8 out of 10 !" FXXS: ""Let him jolly well drown", is obviously what the swimmers think about their mates that are currently in danger of drowning. And that they even are in the way and can cost a live and are not threatened by the snakes is really quite escapist especially that you do not have to rescue the swimmer when you have tidied up the area completely.... However, still 7 out of 10 points, exactly because it is something different. What a pity that there is no Baywatch patch... Or a patch that reduces the "calories for saving swimmers" and in return gets rid of the reduction of "hut calories" when losing a life." TheRyk: "A true hit, though hardly regarded in most alltimes charts. 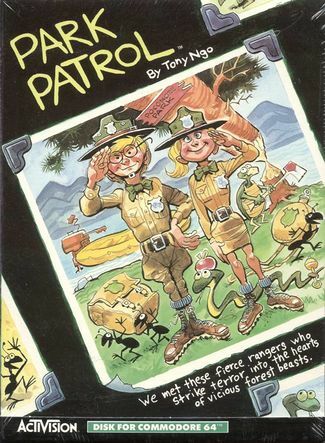 Considering the release date, there's nothing like Park Patrol, fascinating by a variety of game ideas which are easy to understand for the player, though. Moreover, the difficulty increases quite comprehensibly, and the parallax scolling and game physics are really smooth. There are hardly any unfair situations but tons of fun. Graphics and sound are functional. The only downer for highscore hunters might be that the resuce mission, i.e. the event generating most score, appears rather randomly, so you can have an extremely high score in rather low levels and - if you are unlucky - vice versa, but who cares really? I'm convinced enough for 9 points." Camailleon: "I liked playing Park Patrol in the older days and it has not lost much of its charm today. Only the fact that the swimmers want to be rescued randomly which not only has influence on the points as already mentioned above, but also on the supply which determines, whether you have enough for the next life, is really a pity. Because being packed with over 1000 points of energy and some lives, you can only watch as the ants carry away your supply one after the other and if you eliminate them, the food lies around somewhere. Losing a life with 0000 supply in the hut and over 1000 energy means Game Over, although you have more than enough lives for the next level and the food lies around on land. The possibility to carry the food back to the house would have been great." Cover and Inlay of the original disk version were designed by the US American cartoonist Jack Davis, who amongst others worked for the MAD magazine for decades (page with title images and drawings). For the re-release of the game was the name of the park changed from "Poconose" to "Papatoetoe". Maybe they feared complaints from the tourism sector in the Pocono Mountains. 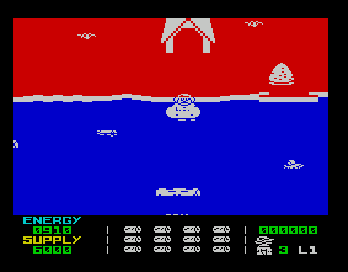 ZX Spectrum version with the usual fearless choice of colours. Longplay through the game by DerSchmu. 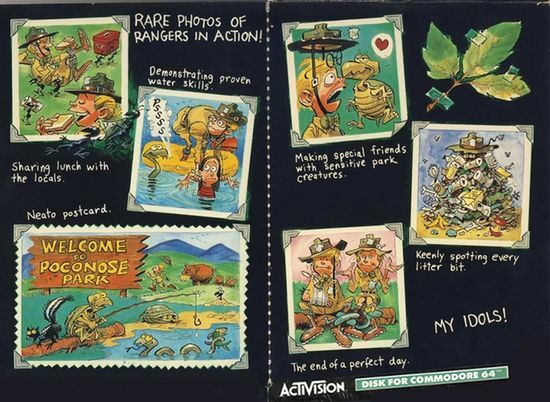 Inlay of the disk version: MAD designer Jack Davis gives us an impression of the goings-on in Poconose Park. 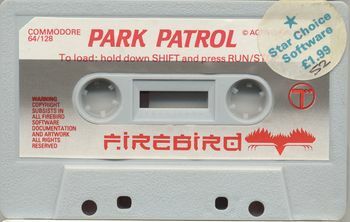 Cover of the cassette version on the "Silver Range" budget label by Firebird. 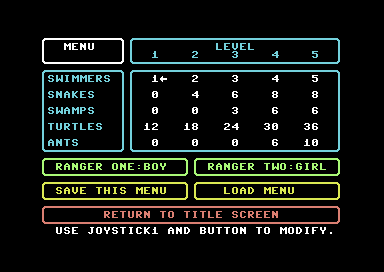 The main parts of the points in the game is done by rescuing the swimmers, but these get into trouble randomly and also allow "Score whoring" by delaying the end of the level on purpose. Therefore does not the highest score count, but the reached level! 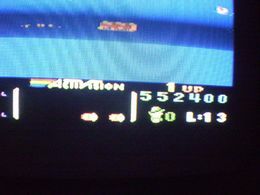 When the same level has been reached, the number of already collected objects counts as a tie-breaker and only then the score. This page was last modified on 13 February 2016, at 16:38.